Work my brother, Bert G. Shelton, has done which is attracting a great deal of interest, particularly in engineering and resource conservation. Inspired by the Panama Canal, he has developed both hydraulic and mechanical methods for lifting very large vessels more effectively and efficiently, while minimizing the use of water.With the current Panama Canal expansion underway, it is being looked at very closely as a possible to solution providing far greater capacity increases (quadrupling instead of only doubling) with the same water, including two even larger lanes, while reducing or eliminating other problems like the saltwater intrusion issue, and providing for further expansion. Our father, Bert J. Shelton founded the Institute of GeoSciences at the University of Panama, plus worked on numerous canal-related projects. His work and that of his father, who helped build the canal, plus my brother's own experience in the area provided the impetus for this development effort. For this reason I want to be sure you and others continue to be involved in providing the continuing unbiased and impartial evaluations that have been so important in developing this latest advance in canal technology..It has truly inspired me to see that innovation is still possible even in areas as "old" as "canal technology"! My brother's mechanical ship lift -- the SSL -- is particularly noteworthy in that the Discovery Channel declared some years ago that such a lift was "...beyond Extreme Engineering". It would be very much appreciated to receive feedback from you on either system, but the hydraulic one is particularly urgent. There is still a chance to incorporate it into the project today. 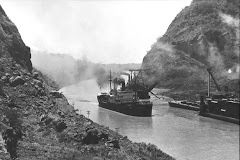 The resulting integrated system would transform the Panama Canal expansion into the world's most visible example of true sustainable development. Subject: Panama Canal Recommended System: Slave-Tank Locks (shorter pres)Attached is a shorter presentation on Bert Shelton's recommended integrated system, given to the Panama Canal Authority (ACP). It contains illustrations of how the slave-tank locks operate -- using the same components as the existing locks and the planned side-tank locks -- to yield far greater water savings and transit capacity, with far less environmental impact. Feedback from experts in various fields has helped this development process succeed and continues to be very important. Copied below is some additional information about the alternative system.Please feel free to forward, post or distribute any of this material. A new water-saving lock variant has the potential of being very beneficial to the Panama Canal Expansion project. This new lock design, known as the 'Slave-Tank Locks', would significantly increase the capacity of the Panama Canal beyond current plans, with the same water, provide two larger lanes (instead of one), allow for future expansion and greatly reduce, if not virtually eliminate key environmental concerns, when integrated into the system.This information on advances in canal technology has been provided to the Panama Canal Authority (ACP). It is still not too late to make the necessary modifications to incorporate them in the project, which would ensure the long-term future of the Panama Canal. Slave-Tank Locks are comprised of traditional components – chambers, gates, tanks,piping, and valves – and they operate using gravity flow, as istraditional. Having two lanes as a key element of their design, these new locks are arranged, and their components interconnected, such that the componentsare used more effectively than with other designs. The new lock arrangement not only uses less water per transit, it does so having relatively fewer components and with fewer water moves as compared, for example, to side-tank locks. With the new lock, a twin-lane Alternative System for the Panama CanalExpansion has been developed that can be operated with the water thatis presently slated to operate one lane. This alternative can yield 67% more daily transits than the 12 the planned system reportedly yields. The three known water-saving methods – steps, "recycling", andtransit-by-transit lane reversal – are combined in the AlternativeSystem to minimize the use of water. Having two lanes is of benefit, because, should an unavoidable or an unplannedlane shutdown occur, the most critical large-ship transits could stillget through. Attached is a Power-Point file containing a series of slides extracted from alecture on lock systems for reference to allow visualizing thealternative system and new lock design. The Alternative System has two steps at each end of the canal. Its layout includes Miraflores Lake and a new small "lake" – more of a short channel segment – at the Gatun end. The primary function of those "lakes" in this system is to permit the locks to be reversed transit-by-transit, which cuts the per-transit water-useeffectively in half. A secondary benefit of the presence of those "lakes" – between Gatun Lakeand each respective ocean – is the buffer they provide against theintrusion of saltwater. They not only disrupt the process that normally brings up the highest concentrations of salt, they serveas the place in which to perform practical saltwater mitigation procedures. Miraflores Lake, whether it was intended by design to or not, today performs that function. The Base Case Design of the Alternative System would have a total of 8 main chambers, and a total of 16 main gates. It would have only six (6) recycling tanks. Three of the two-lane single-step lock units of the Alternative System would be of Slave-Tank design. Thefourth lock unit – the one next to the present locks of Pedro Miguel –would not have recycling tanks; the unit would look like a largerversion of the locks presently there. The Slave-Tank lock units of the Base Case Design each would have two (2) recycling tanks. Itis possible to add two (2) more tanks to each of these, in a "secondfloor" arrangement, and further reduce water-use, by nearly 25% for the system. In other words, the system has additionalwater-saving capabilities that could be added now or in the future, aswater-use needs change. The Alternative System's development also considered where to obtain operating water. It is recommended that operation of the existing "older" locks be modified when the new locks come on line. They should be operated in their "50%" water-saving mode, at least part of the day. That per-transit water-savings can be obtained whether ships all transit inone direction or the lanes are transited in opposite directions. The procedure requires tighter scheduling of ships. Theoptional water-saving mode is slower, which means fewer ships willtransit those locks in a day, but the benefits to using that operatingmode are significant. modifications to facilities and structures all around the lake go away. trusted lake management procedures need not be altered. Also, four (4) feet of dredging into rock the length and width of the Cutwill go away; that work can be re-directed to making wider ship-passingareas along the canal route. To illustrate the power of shifting water-use from the present locks tothe proposed Alternative System, consider reducing transits of theexisting locks by one third. 24 to 26 transits a day of the present locks would result. The time normally used to transit another 12 to 13 ships would be left over. The leftover time would be distributed among the transits to save water. The 24 to 26 transits would use only 12 to 13 normal transits-worth of water. 24 to 26 normal transits-worth of water would be left available for the new locks. The Base Case Alternative System needs only 11 present lock transits-worth of water. A SECOND Base Case Alternative System can be operated, with the water left over. Having water left over means that the chambers can be enlarged some, which has its own benefits and future potential. Publicized information about the planned Panama Canal Expansion seems to indicatethat the planned system, comprised of the new and the "older" locks, isto transit a combined 42 ships. 12 transits will presumably be of Post-Panamax ships carrying up to triple the cargo of a Panamax. That leaves 30 transits of Panamax size or smaller ships through the "older" locks. Max cargo capacity for the system would then be equivalent to about 66 Panamax transits. It is estimated that the Base Case Alternative System's max cargo capacity– combined new and old lock transits – would be equivalent to about 94Panamax transits. If the capabilities of the water the "older" locks presently use were maxed out per the approach described above, the canal's max cargo capacity would be equivalent to about 144 Panamax transits. Only after that does enlarging the watershed have to be contemplated. In effect, this alternative resets the target for the consortia to meet orexceed in their proposals, in relation to cargo capacity that their designs extract from the canal water resources. Any design that ties up resources less effectively permanently lessens the future benefits the canal can extract from its water resources. The objective of this effort was to develop the most effective lock systempossible (as was the case with the mechanical system (SSL) presentedpreviously to the ACP). It has been carried out to ensure nostone has been left unturned in Panama's effort to present to the worldthe finest canal expansion possible – a canal that will be held in thehighest regard for generations to come. The document below describes breakthrough advances in canal technology and efficient water use that are eliciting a lot of attention in Panama and abroad. By incorporating its recommendations into today's project -- which is still possible at this point -- a sustainable and responsible expansion of the canal would become a reality: significantly increasing its capacity (quadrupling, not doubling) using the same water, with two even larger lanes (not just one), the possibility for future expansion (unlike with the present plan), and virtual elimination of the saltwater intrusion problem and of other environmental concerns. If not done, the Panama Canal's future is in jeopardy. Alarm in Panama is already growing due to senseless decisions -- such as the legislation allowing the effective urbanization of the canal watershed -- threatening the canal itself and encouraging an exponential increase in environmental devastation throughout the country. Many grassroots citizen action groups have formed in response. More people need to be made aware that real alternatives exist. Impartial and unbiased assessments of the integrated solution described below, along with the courage to ask the right questions before it really is too late, will ensure the Panama Canal's long-term future. The plan to expand the Panama Canal, announced in 2003, came with lock type and system layout pre-established. This world important project was launched with its most critical mechanism – its locks – predefined. Skipping of a proper identification and selection process for the mechanism that can make or break a canal project, especially this project, shocked many experienced engineers. That shortcut and the seemingly unwavering determination of the project’s promoters to stick to a pre-set plan and schedule – summarily declaring irrelevant all nature of shortcomings and concerns raised by others outside of the project – prompted independent engineers to perform a parallel, unbiased assessment of the project. This included investigating existing locks and mechanical ship-lifts, and developing improved designs. Contrary to claims that the project’s selected side-tank locks are the best, and only, water-saving locks suitable for the project, the independent effort netted several competitive arrangements for the Canal employing different water-saving locks that can add more transits for the water used. Also, it succeeded in developing more efficient locks. Therefore, it is urgent that the lock selection be revisited. Not only is it possible to competitively enhance the capacity of the Canal, it is also possible to address concerns previously dismissed for lack of solutions. The Panama Canal is too valuable a world resource for this public works project to be rushed into adding first-generation (i.e. 19th century) water-saving locks to it, when its original locks already contain more efficient second-generation water-saving technology. At minimum, third-generation lock configurations of even higher efficiency should be considered. But, the lock selection process to identify such alternatives was skipped in the apparent rush to advance the project into the construction phase. By the time the planned expansion has been constructed and inaugurated in 2014, the job will have taken over 10 years to complete. It will have cost billions ($); yet, its projected growth target is only 10 years. That growth target is ridiculously short for any canal project, and especially for one taking that long just to build. To keep up with growth, it will be necessary to launch a subsequent expansion at about the time this one is being completed! Instead, for an effort similar to that needed to complete the present plan, an optimized system could be built that provides for more transits with less risk of disruptions, and that causes less environmental damage. An optimized system, that adds two-lane third-generation state-of-the-art water-saving locks to the canal, instead of the planned, much less efficient, one-lane side-tank locks, should be built. Such an alternative system would about double the cargo capacity that the planned system is to add, and its second lane would significantly increase the reliability of the service added. It is also strongly recommended that the water to operate the new locks be obtained from the Canal’s original locks by operating those in their more efficient mode part of the time. With the new locks and such a change to old-lock operations, plans to modify the fluctuation range of Gatún Lake’s level to increase the supply of water – and, possibly, to enlarge the watershed of the Canal – are unnecessary. This recommended system is comprised of the same parts that the planned side-tank locks and the original Panama Canal locks use; to increase efficiency, the difference is in how many of each part gets used, how those are arranged and interconnected, and how transits are sequenced. With its simple alterations to the lock-unit’s configuration and to the sequence of operations, along with its relatively fewer parts and fewer water manipulations, the recommended system reduces water-use more per transit than the planned system. Furthermore, only practiced ship-handling procedures are used; no new ship-handling maneuvers are needed. As no new parts or operations are required, the recommended system meets the Panama Canal expansion project’s criteria that only known and proven lock technologies and operating techniques are acceptable. The recommended system calls for the installation of two new single-step twin-lane lock units, with a section of channel between them, at each end of the canal. The original locks have a “section of channel ” – Miraflores Lake – between units at the Pacific end of the Canal, proving that separating steps is not an issue. In contrast, the present plan is to build a three-contiguous-step single-lane lock unit at each end of the Canal. The recommended lock system would have eight (8) chambers, plus either six (6) or twelve (12) recycling tanks. Choosing how many tanks to use depends on what water-use reduction is desired. The planned system has six (6) chambers and eighteen (18) recycling tanks. The recommended system’s configuration permits all three water-saving techniques available to canal systems to be used simultaneously. The planned system can capitalize only on two of those techniques. Both systems use locks that recycle water. Both systems have steps that subdivide the lift height, which reduces by that subdivision the amount of water needed to complete a transit. Only the recommended system, however, can capitalize on transit-by-transit lane reversals, which permits the water that lifts one ship to lower another. That alone cuts water use in half! The planned system is to use about 14.41% the water that a single-step full-height “normal” lock would use per transit. That comes from water-use being reduced to 33.33% by dividing the ocean-to-lake lift into three steps; recycling at each step further cuts water-use to 40% of that 33.33%, or 13.33%; and, finally, to that is added 1.08%, which is each transit’s share of the water used during the daily reversal of the lane. The estimated transit capacity of the recommended two-lane system is 20 transits per day, which can also be stated as 10 transits per lane or 10 transits in each direction. As success of the water-saving method of reversing the lane transit by transit is predicated on a balanced flow of traffic through the new locks, tandem transits of smaller ships are substituted for post-Panamax vessels missing for a given transit so that the new locks are fully used each day. The original locks can absorb the smaller vessel traffic imbalances those substitutions may cause, whether those locks are operated in their standard or in their water-saving mode, and whether there are an equal number of transits in each direction or if most (or all) transits are in one direction. The recommended system’s throughput estimate of 10 transits per-lane is comparably less than the planned single lane system’s 12 transits per day, because it takes more time to save more water. However, the combined 20 transits per day through the recommended two-lane system, which will consume about the same amount of water as the 12 transits of the planned system, more than make up for that difference between lock transit times. The key arguments that make it imperative that the expansion plan be changed are: firstly, that the recommended system greatly increases the canal’s income generating capacity; secondly, its two lanes significantly reduce the risk of service disruption; and thirdly, it significantly reduces environmental impact. While the recommended system most notably calls for a change in lock type used, as well as the layout of locks at each end of the canal, there are also a number of other items to be changed in conjunction with the locks. Resulting project cost increases and decreases for all changes must be summed in order to fairly compare total project costs of the planned and recommended systems, which it is contended will net out to comparable amounts. As described earlier, the recommended system calls for a third more lock chambers (8 instead of 6), but only one-third (or two-thirds) of the recycling tanks (6, or 12, instead of 18) depending on what amount of water-savings is desired. The present plan is to have traffic through the new set of locks circumvent Miraflores Lake, which requires that a 3-mile long virgin channel be dug and that a dam be built across faults that in the original system are crossed by Miraflores Lake. Conversely, the recommended system incorporates Miraflores Lake, firstly to reduce water-use further for more transits, secondly to bridge across the faults and avoid the above noted risk of a dam failure, and thirdly to serve in the control of salt intrusion. Also, a lot less digging and dredging would be required, as more of the existing channels and lake, and more of the third-lock-set diggings already done by the US, would be used. The planned approach for insuring an adequate supply of operating water, which involves amplifying Gatún Lake’s operating level range, will at times reduce the transiting capacity of the original locks. And, it will require that all of the channels in the Canal’s 40-mile stretch at lake-level be dredged down an extra 4 ft. Not only does that deepening require that an enormous amount of material be removed and dumped somewhere, that dredging is into the hardest material at the bottom of the channel – likely basalt – making that blasting and dredging exercise extra expensive. Plus, the deeper the channel is dug, the wider it becomes at the surface in order to maintain side slope stability, which means still more material to dump somewhere. That extra 4 ft lowering, and the extra 1.5 ft the lake’s level is to be raised, will also make it necessary to make changes at the original locks and to modify or strengthen Gatún Lake’s many dams. It will also cause public and private facilities throughout the lake to incur modification costs. Lakefront businesses will also suffer thereafter. The recommended system’s operating methodology, on the other hand, avoids all those lake-level issues and cost impacts. The present plan is to add a single new lane for larger ships, and it is claimed that the new lane need never be closed for maintenance. Is that claim believable? Over the past century the Canal’s original locks have required innumerable lane shutdowns. Many shutdowns were for programmed overhauls, but many others have been un-programmed or unexpected closures inserted on short notice to repair accidental or unpredictable damage. With the recommended two-step two-lane system, one of the lanes would always be in service should the other lane need maintenance that shuts it down, just like with the original locks. The reliability that a second lane adds for larger ships transiting the Panama Canal has a significant economic value that should not be ignored. Neither should be ignored the fact that the recommended system virtually eliminates the problem of salt intruding up the new locks into Gatún Lake, that simply because its locks are laid out differently and the operating sequence is re-ordered. In contrast, there are no practical methods to control the intrusion of salt up the planned locks and avoid the problems the oceans at each end could face from potential increases in the lake’s salt concentration. Thus, it’s been observed that concerns regarding salt damage potential have been downplayed or disregarded by the project. The extent of environmental damage is not easy to estimate up front nor is it easy to monetarily quantify. Over time, however, the price paid for damage done to the environment will become apparent. The wiser course to take would be to minimize ecological issues while increasing the expansion’s potential to generate revenue, especially if doing so doesn’t add much cost. The Panama Canal Expansion Project’s promoters are presently seeking financing. Before loans are extended, it is strongly recommended that the plan be assessed and confirmed by independent and unbiased reviewers, who are truly knowledgeable – and who can’t be bought off. Not doing so is to perpetuate greed-based choices that cause economic crises like that currently afflicting US Investment Banking, and like those that afflicted other market sectors not long ago. At a time when everyone is being encouraged and even legislated to become more socially conscious – to reduce energy use, to recycle, and to reduce pollution, etc. – adding new, relatively inefficient, locks to the Panama Canal, which will cause more pollution than is necessary, goes completely against those efforts, and is simply wrong. Water is Panama’s primary energy source; its potential must not be frivolously wasted; neither should Gatún Lake’s freshwater be needlessly polluted. People, animals and a great variety of plants depend on that water, in addition to world commerce. Additionally, execution of the project will consume huge quantities of materials and fuel. To waste those intentionally by not maximizing the Canal's returns relative to what the changes and additions to it will cost is a crime against everyone. It must also be understood that – once the locks are cast – the planned system’s inefficiency becomes permanent, as does that system’s assault on the environment. The planned system cannot be revised later to enhance its performance nor changed to stop salt-pollution from happening. Fixes have to be thought-out and incorporated into the design before construction. Also, the Canal’s peak transit potential is permanently lost once the present plan becomes reality. All around, it would be a very bad business choice to build the presently planned system. In expanding the Canal, it makes no sense to add half of the capacity that could be added for the same cost and effort, and 10 years later spend even more money than that to add the “other half” – assuming it is even possible to make such an addition after building what is planned. On the other hand, using the recommended system would not only result in the equivalent of two expansions for about the price of one, it would leave open the option to do yet another equivalent expansion in the future. Another equal expansion would not only be possible, it would be simpler and cheaper to build than anything being contemplated for after the job now planned. Regardless of the work already done, the availability of greater long-term benefits demand a change in plan before it is too late. If state-of-the-art Post-Panamax locks were used in this and a subsequent expansion of the Panama Canal and the combined system were operated in its optimum manner, the tonnage of cargo transited by the water presently used to operate the original Panama Canal locks could be up to quadrupled (4x). Quadruple yield can be attained by operating the original locks in their optimum mode, using about half the water now used per typical transit, and reducing daily transits to about two-thirds of the usual. Enough water would, then, be left over to operate two of the recommended twin-lane Post-Panamax locks; in other words, a future total of four new lanes. That translates to about 26 Panamax and 40 Post-Panamax vessels per day; and, that without changing the established, and time-tested, lake levels and watershed management procedures. The present expansion’s planned side-tank system won’t quite double (2x) today’s Panama Canal yield. It’s been reported that on average there are to be 42 transits of the expanded system a day that will provide that yield; presumably 12 Post-Panamax vessels are to transit the new locks, which leaves 30 Panamax transits through the original locks. The planned system requires that more of the water presently entering the watershed be retained to achieve that yield, so the range over which Gatún Lake varies is to be amplified to increase the system’s usable water supply. While with the present expansion plan the option to enlarge the watershed is being kept open, that is unnecessary with an optimized system. Considerable money and effort is saved by not having to displace people from their homes and their livelihoods, and the environment is spared the invasion to add new lakes and aqueducts. To minimize water-use, the recommended alternative system capitalizes on the maximum water-savings offered by each lock-unit, both new and original, plus it capitalizes on water-savings that can be obtained by transiting ships through both the new and original locks using known transiting procedures that are used less frequently today; calling for no unknown procedure that uses some new ship-handling maneuver. To operate most efficiently, ship movements through the alternative’s arrangement must be coordinated differently than what is customary today. Efficiency can be only be maximized if transits in each lane are in step with each other within acceptable bounds; that is because filling and draining procedures of laterally adjacent chambers must happen simultaneously. The third-generation water-saving locks of the recommended system are a recent development. They are a combination, or integration, of first- and second-generation water-saving lock layouts. The new water-saving locks are comprised of only known components; no new lock components are introduced. Their greater efficiency comes from how their chambers and water-recycling tanks are arranged and interconnected to minimize parts, operations, and water-use. The original Panama Canal locks are an example of second-generation water-saving locks. Within those two-lane locks, although not traditionally used, there exists the capability to share water laterally between the side-by-side chambers at each step. Sharing water laterally permits water-use to be reduced by nearly 50%. With the original Panama Canal locks each chamber can both transit a ship and serve as a water-recycling tank. The first-generation water-saving system – or side-tank system – presently planned for the Canal’s expansion requires tanks separate from the shipping chambers just to hold the recycled water for a spell. One recycling side-tank per chamber permits lock water-use to be reduced to 67% in two water-moves. Two recycling tanks permit water-use to be reduced to 50% in three water moves – which is the savings that the tank-less original Panama Canal locks can offer in two water-moves. The Canal expansion’s planned side-tank locks, with three side-tanks per chamber, reduce water-use per transit to 40% in four water-moves. Note that, for the side-tank system to work efficiently, each tank’s area must be greater than that of the main chamber; thus, these are not little tank structures. Also, each tank must be independently connected to the main chamber by huge pipes and valves; and, those tanks must be sequentially filled or drained when operated. That translates to a lot of big parts and a lot of operations, and more operating time with each tank that is added. The third-generation water-saving locks augment the lateral water-sharing capability of the second-generation locks by adding first-generation recycling tanks at each step, these connected to both chambers at each step. Two tanks and four water-moves are required to reduce the two-lane lock unit’s water-use per transit to 33.3%, both lanes being manipulated simultaneously. Four is the same number of water-moves that the planned single-lane triple-side-tank locks require to reduce per-transit water use to 40%. In terms of tanks-per-chamber, with one tank per chamber a third-generation water-sharing lock uses less water per transit than a first-generation side-tank lock with three tanks per chamber. The new locks are the key element of the recommended two-lane alternative canal system developed, because they allow fewer steps to be used, making it economically feasible to consider a lock arrangement that permits more water-saving features to be combined. There are a couple other ways, besides employing lock-unit water recycling, to reduce canal-system water-use. One of the other ways to reduce water-use is to add steps. Split a single-step lock into two steps and use 50% the water; into three steps and use 33.3%; 4 steps, use 25%, etc. The three-step original Panama Canal locks as traditionally operated use 33.3% the water that a one-step tall lock would use, if such a tall lock were even physically possible to build in Panama. If the lateral water-sharing capability of the original Panama Canal locks were to be employed, original lock water-use could be cut in half, which is 16.7%. The water-use of the planned three-step triple-side-tank locks for the Panama Canal is 13.3% on an equivalent calculation basis; that figure is obtained by dividing the locks 40% water-use, obtained through recycling, by the system’s three steps. The other other-way to save water is to reverse a single-step lock transit by transit; doing so cuts water-use in half (50%). This operation can actually be done at the Panama Canal’s single-step lock unit at Pedro Miguel. The other lock units have multiple, contiguous steps; thus, they cannot capitalize on this option. In principle, it is possible to combine all three water-saving methods to minimize the expenditure of water in transit operations. The Panama Canal original and planned locks show that combining two methods is routine. Less known is that all three methods can and have been applied in combination at the Pedro-Miguel Locks of the Panama Canal. The per-transit water-use of Pedro Miguel’s single-step lock can be reduced to 25% by simultaneously sharing water laterally and reversing each lane with each transit, given that each of those water-saving methods individually saves 50%. Since that reduction of water-use cannot be attained at the Miraflores Locks, that capability is presently of little use to the Panama Canal. However, that capability does prove useful in the optimization of the combined new lock and original lock system being proposed for the Panama Canal. If a new lock system for the Panama Canal were to have two steps, each step having a third-generation lock that uses 33.3% of the traditionally used water; and, if each step were reversed transit-by-transit; then, the base case system’s water-use would be 8.33% (33.3%/2/2) per transit. Thus, with eight (8) main chambers and eight (8) tanks, for a base case system comprised of third-generation locks, about two-thirds more ships can be transited than what can be transited with the same water in the planned system, which is comprised of first-generation side-tank locks and having six (6) main chambers and eighteen (18) tanks. If one considers the transit scheduling changes needed to reduce original lock water-use, and if one evaluates what it takes to capitalize on the water-saving potential of the alternative plan, it becomes clear that it is possible to extract a lot more service from the Panama Canal system than what is permitted by the solution that was pre-selected. And, the system to do that with is not terribly different from the planned system in terms of structural scope. While each transiting ship’s canal residence time would theoretically be greater with the recommended alternative than with the presently planned system, the price to pay for that added “inconvenience” is quite small when considering how many more transits per day are possible using the alternative and accepting that inconvenience. On the flipside, should the presently planned system – that only about doubles canal capacity – be built, permanently lost will be the opportunity to build a system that can quadruple the canal’s capacity using only the water that is consumed today in operating the Canal's original locks. Assessing the economics of saving water requires the concurrent evaluation of multiple factors such as projected transit demands, water availability, ship-movement times, gate opening/closing times, water-movement times, cost of lock elements built/installed, projected income potential as affected by the cost of competing systems, etc. To do such an assessment for one system is daunting. Doing it for multiple systems seems impossible. However, it is not impossible and it would not be a lengthy process. Locks are not complicated structures. They are comprised of relatively few major components, and they are repetitive in their construction. The alternative being proposed consists simply of a new arrangement of the similar parts – a few less of one part, and a few more of another part. There are no new, difficult to cost, parts to deal with. The same goes for ship handling; the only things that change are the number and the order of procedures. Thus, the task of comparing different systems rapidly simplifies. Given the huge potential for gain, it would be well worth the short-term effort to assess options that have been excluded until now and ensure the Panama Canal’s long-term viability.